In a study published this month in the journal Angewandte Chemie, the UCLA team developed a 1-by-2-centimeter silicon chip that is covered with densely packed nanopillars and looks like a shag carpet. 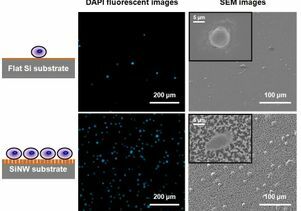 To test cell-capture performance, researchers incubated the nanopillar chip in a culture medium with breast cancer cells. As a control, they performed a parallel experiment with a cell-capture method that uses a chip with a flat surface. Both structures were coated with anti-EpCAM, an antibody protein that can help recognize and capture tumor cells. The researchers found that the cell-capture yields for the UCLA nanopillar chip were significantly higher; the device captured 45 to 65 percent of the cancer cells in the medium, compared with only 4 to 14 percent for the flat device. Study collaborators included Dr. Hong Wu, of the UCLA Department of Molecular and Medical Pharmacology; Dr. Allan Pantuck, Dr. Robert Reiter, Dr. Matthew Rettig and Dr. David Finley, of the UCLA Department of Urology; and Dr. Jiaoti Huang and Dr. David Seligson, of the UCLA Department of Pathology and Laboratory Medicine. Additional study authors included Dr. Jing Jiao, Kuan-Ju Chen, Gwen E. Owens, Dr. Ken-ichiro Kamei, Dr. Jing Sun, Dr. David J. Sherman and Christian P. Behrenbruch, of UCLA's Crump Institute for Molecular Imaging, Institute of Molecular Medicine and California NanoSystems Institute.